I don’t think I’ve seen the opening mentioned on your blog, though you did write about it earlier this year. The website is here. 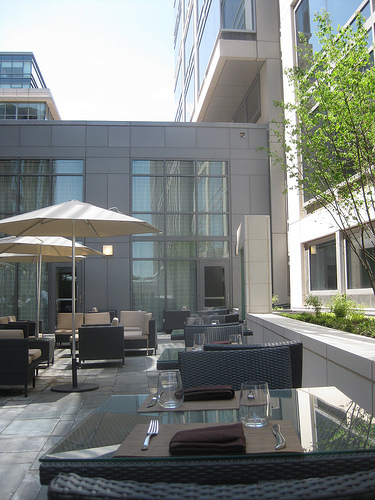 NoMa’s first fine dining restaurant opens today, along with the neighborhood’s second hotel. Todd Gray’s Watershed and the 204-room Hilton Garden Inn opened with a splash at 1225 First Street, NE, offering a luxurious hospitality experience and seafood from the Eastern seaboard. A grand lobby features a cascading waterfall leading to the second floor, which holds the ballroom, lounge, business center and Watershed. Watershed is the latest venture of restaurateur couple Chef Todd and Ellen Kassoff Gray, known for the highly-acclaimed Equinox restaurant. Guests are first welcomed into an intimate lounge area where they can enjoy specialty cocktails, small plates and a daily raw bar selection featuring a coast-to-coast variety of oysters from Kusshis and Hama Hamas to Chincoteagues and Wellfleets. Crudos of the day, game specials and a seafood selection including Chef Todd’s signature Rappahannock River oyster sandwich, take center stage at the restaurant’s Chef’s Table at the top of the 65-seat main dining room. Floor-to-ceiling windows open onto an outdoor patio seating 45 guests.